REALbasic 2007r2 introduced the incremental compiler, but this compiler has a few bugs. It does not recompile code if just the plugins change, so you need to clear the cache when installing new plugins. Everything in this caches folder can be deleted safety. Applications are advised not to save important data there. The typical problem here is that dlyd can't find a specific symbol in the exectuable file because the plugins changed. In that case a plugin function was renamed and Realbasic linked an app which tried to load the old function from a new plugin file. 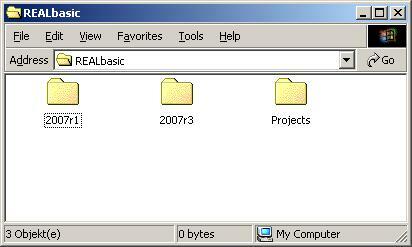 go to the folder ~/Library/Caches/Realbasic (~/Application Support/REALbasic 2006/ for REALbasic 2006) by clicking through the folders or using the "Go to folder" menu command. Move all stuff inside this folder to the trash. You find the REALbasic folder with the caches in your user folder. Delete it and relaunch REALbasic.